We were asked to completely re-design the website for 24/7 Fitness, a rapidly expanding national chain of gyms in the UK. Our brief was to modernise their brand and bring their digital presence right up to date with a fast, clean looking website that would cater to all users on mobile devices, tablets and PC’s. 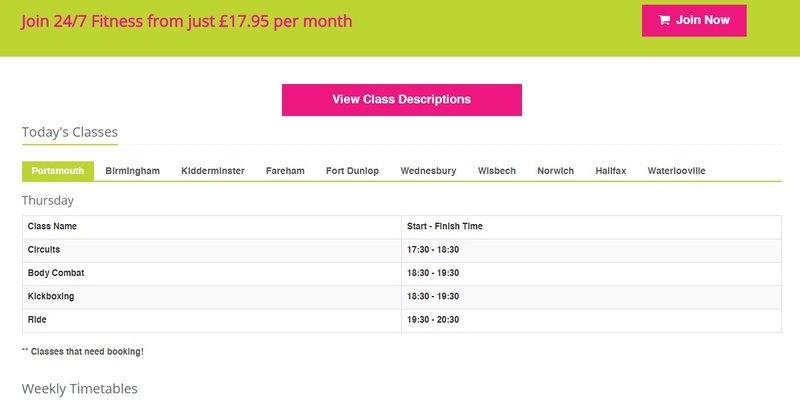 We needed to incorporate the timetables for each gym in the chain and include specific information and videos for each site. Prospective members also needed to be able to access the portal allowing them to join on line. We set about creating the website using custom coding in the Laravel framework to ensure a stable and rapid experience even during periods of heavy use. The design was brought about using 24/7’s corporate colours to bring attention to ‘call to actions’ and a series of greys to maintain a very modern feel in the main body of the site. Please feel free to contact us to learn more about the Laravel framework and how we can produce a website for your business. We needed a web developer who could produce results in short notice to allow us to seize real time opportunities. Surfworks had the right answer ever time and continue to work around the clock to help us reach our chosen audiences. They understand our vision whilst offering sound digital future proofing advice.